Following a short parade down Main Street from the Courthouse to the Civic Center, Hillsboro Mayor Jerry Willey provided opening statements for the day’s festivities, which City Councilor Olga Acuña translated. With her term expiring this November, Acuña’s role as the council’s sole Latino representative will soon come to an end. She used the speaking opportunity to draw interest toward a Latino council replacement. Though it rained for part of the morning and afternoon, a break in the clouds let the sunshine in following an indigenous dance performed by the Huitzilin Cultural Group from Dayton, Ore.
HILLSBORO TRIBUNE PHOTO –– The Huitzilin Cultural Group of Dayton, Ore., performed an Aztec sun dance, which seemingly worked as the rain literally stopped for a moment to kick off the 12th annual Latino Cultural Festival in downtown Hillsboro Sunday. And at the Civic Center plaza’s main stage, mariachi group Una Voz, led by Lincoln Street Elementary music teacher Dan Bosshardt, played to a huge crowd. 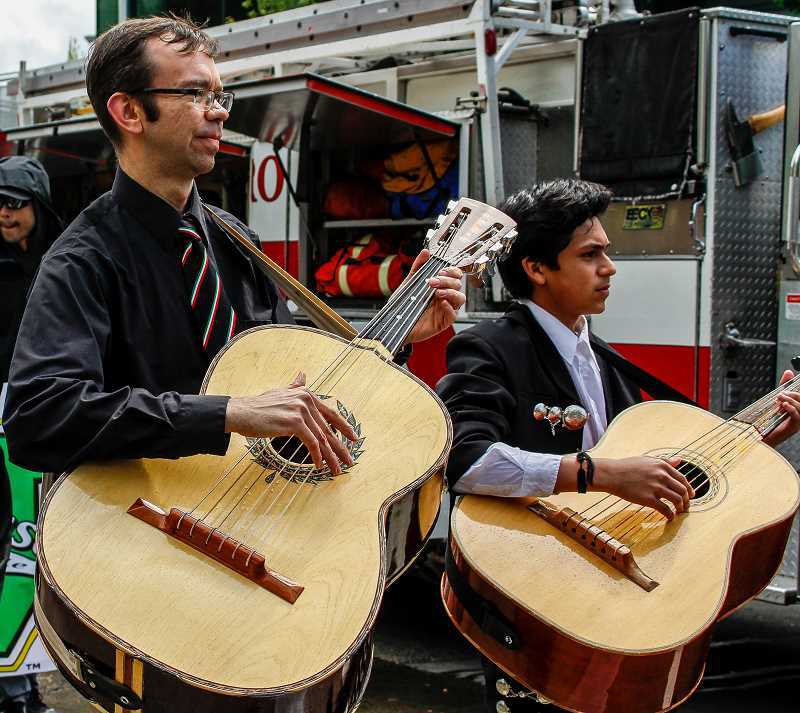 Lincoln Elementary music Teacher Dan Bosshardt (left) plays the guitarrón in the Latino Cultural Festival alongside mariachi group Una Voz. A vital festival for the Hillsboro community, Crowder added, it has been well anticipated by attendees, businesses, and supporters each year. 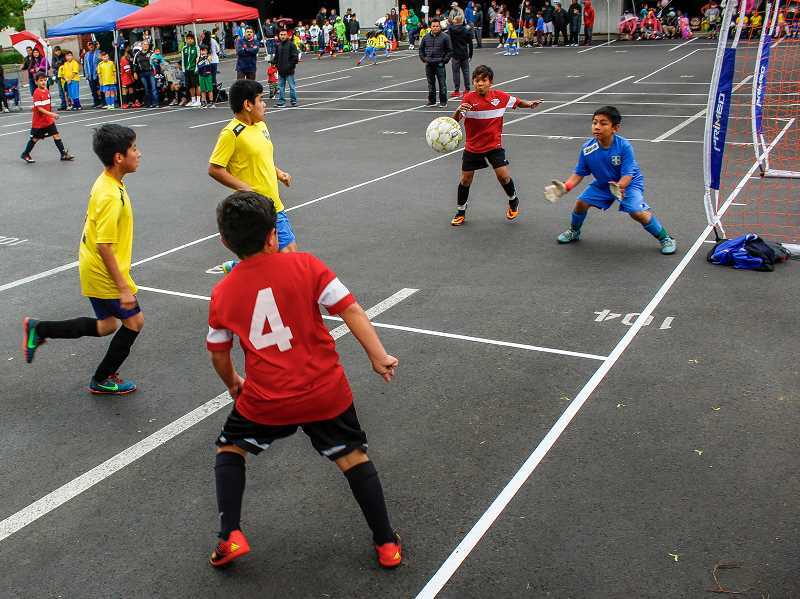 “With our population being about 25 percent Latino, it’s important that we enrich and engage the community in the festivities of Hillsboro’s largest minority,” she said. 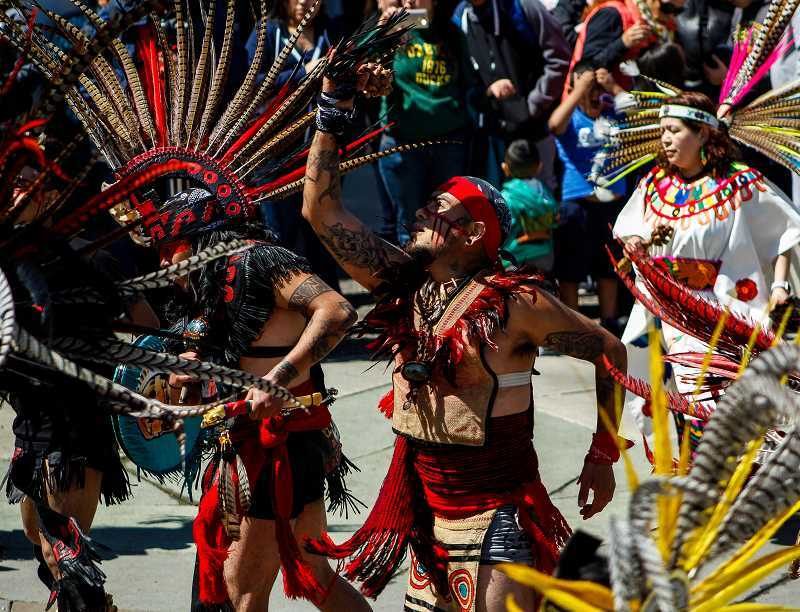 And while the festival is primarily Latino-focused, it’s designed to bridge the cultural gap for folks who might not otherwise be exposed to the Hispanic world otherwise.